There is a lot to be said about first impressions. 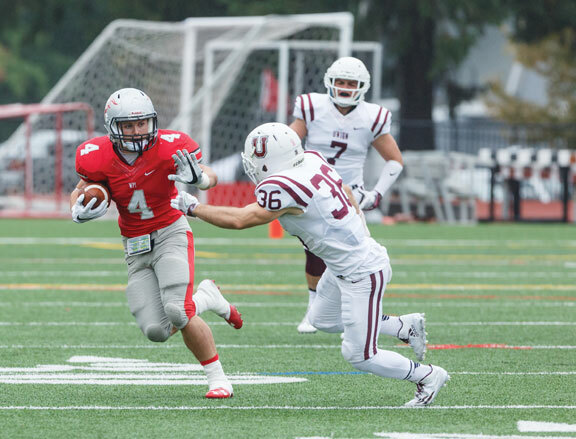 Prospect resident Sean McAllen certainly made the most of his first opportunity playing collegiate football for Worcester Polytechnic Institute. In his first game for the Engineers the former Woodland Hawk turned heads by rushing for 215 yards and two touchdowns, including a 74-yard scamper that had his teammates taking notice. McAllen left the same impression on his teammates at Woodland. He graduated as the Hawks’ all-time leading rusher with 4,555 yards and one touchdown shy of the all-time mark with 65. In his senior year at Woodland McAllen led the Hawks to a 7-3 campaign with a state-leading 1,833 and 31 touchdowns and earned All-NVL and All-State honors. There was a lot of interest by college coaches, but McAllen was looking for academic success as well as continuing his football career and chose WPI in Worcester, Mass. McAllen enjoyed a successful freshman season on the field and in the classroom. He led the Engineers in rushing with 701 yards and five touchdowns and was third on the team with 21 receptions for 268 yards and one touchdown. McAllen even showed his versatility throwing a touchdown pass from the halfback option. The Engineers finished the season 6-4. For all his success McAllen was named the Liberty League Rookie of the Year and made the All-Liberty League second team. He finished second in the league in rushing attempts (170) and was fifth in the league in rushing yards (701). McAllen, who was home on winter break and enjoying mom’s cooking, is looking forward to getting back on the field for his sophomore season. “We are moving to a new conference next year, but we are excited about what we have coming back and looking for another strong season,” McAllen said.